It's Time For The Tactical Christmas Stockings | OhGizmo! By Jeremy Pearl on 12/12/16 • Leave a comment! 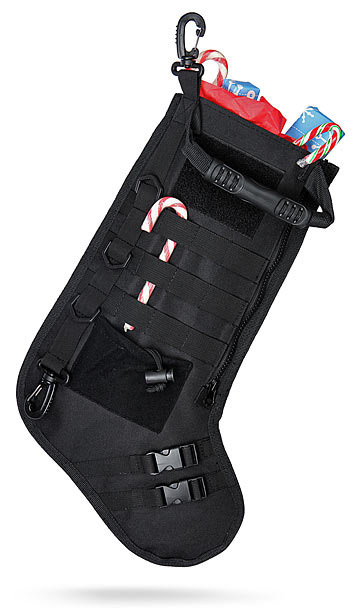 It’s becoming a bit of a thing that around this time each year, we remind you about the existence of these awesome Tactical Christmas Stockings. Made out of rip stop nylon, these badass looking stockings feature MOLLE loops on the outside, but no loops on the inside. There’s a draw-string pouch, a zipper pouch, and a Velcro loop for patches. Insert as many candy canes, lollipops, and assorted doodads to end up with a Christmas Stocking that’s chock full of stuff, inside and out. And make a statement in the process. What that statement is though… we’re not sure. All we can tell you is it’s $25.